Help pick the route for the next UP Steam Excursion by voting for your town. Click the banner above. Canadian Pacific 12th Annual Holiday Train To Run On IC&E Rails! The Canadian Pacific Holiday Train gets its 2010 Midwest start on Saturday, December 4th, operating on the IC&E. The Iowa, Chicago and Eastern is owned by Cedar American Rail Holdings, a subsidiary of the Dakota, Minnesota and Eastern. Created by the purchase of the I&M Rail Link LLC, IC&E commenced operations on July 30th, 2002. The 1400 mile line, based in Davenport, IA, serves the states of Illinois, Iowa, Missouri, Minnesota and Wisconsin. Principal commodities include chemicals, coal, steel, automobiles, and agricultural products. Train dispatching is performed at a joint DM&E/IC&E facility in Sioux Falls, SD. 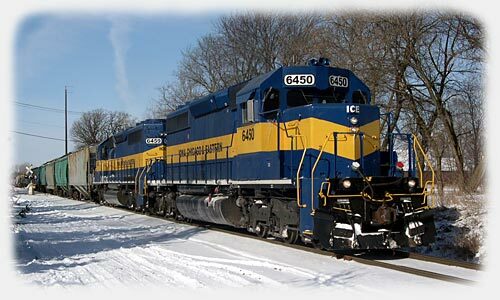 On October 30th, 2008, the Iowa, Chicago & Eastern and its parent company, DM&E, were merged into the Canadian Pacific as its subsidiary Dakota, Minnesota & Eastern. Motive power consisted of mostly ex-UP SD40-2's rebuilt by General Electric and ex-SP GP40-2's rebuilt by NRE in Silvis, IL. Four DM&E GP38s along with several ex-IMRL engines round out the roster. The SD40-2s and GP40-2s are painted in a DM&E inspired blue and yellow scheme with the name of the railroad spelled out on the sides of the locomotive. Starting in 2005 many of the "new" engines carry names of the towns that IC&E serves, a practice utilized on the DM&E. This page is not affiliated nor sponsored by Cedar American Rail Holdings, Dakota Minnesota & Eastern Railroad Corporation, Iowa, Chicago & Eastern Railroad Corporation nor Canadian Pacific Railway. from the owner of this site or owner of images posted on this site.